There is an increasing body of research on resettlement and conservation which shows that management strategies (such as UWA’s) which rely on evicting people from parks not only cause huge problems for local people but are also ineffective as a conservation tool. (iii) provided prompt and effective compensation at full replacement cost for losses of assets attributable directly to the project. Project planning is supposed to avoid and minimise involuntary resettlement. If people lose their homes or livelihoods as a result of Bank-funded projects, they should see their standard of living improved or at least restored. Although the World Bank provides UWA with much of its funding, the World Bank has taken no action to apply its policy on involuntary resettlement to the evictions at Mount Elgon. Villagers evicted from the national park have lost their land and seen their livelihoods destroyed. IUCN has progressive policies on paper about evictions and local people’s rights relating to national parks. Yet IUCN (and its funders, NORAD) remain silent on the human rights abuses and evictions at Mount Elgon. A fair and participatory application of the Forest Stewardship Council’s principles and criteria to the whole national park could potentially help address some of the problems, but so far SGS has sided with the park management against the rights of local communities. The key issue is land rights and land tenure. “The key to developing sustainable practices amongst communities within the park lies in settling long-standing land tenure problems,” write the researchers from Aberdeen and Dundee Universities. To date, the management of the park has completely failed to address issues of land rights and land tenure in and around the park. The FACE Foundation is only one of a range of international actors that is complicit in UWA’s brutal management of Mount Elgon National Park. 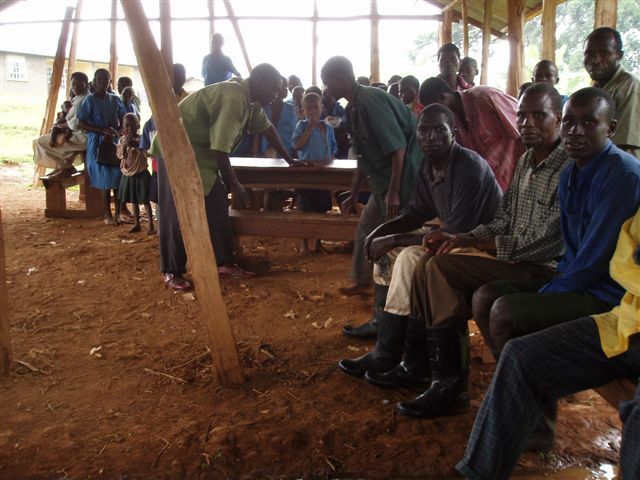 But of all the international projects at Mount Elgon, the FACE Foundation’s project is the most difficult to justify. Although there would be conflicts between the management of the national park and local communities with or without the UWA-FACE tree planting project, the UWA-FACE project is making matters worse. If the UWA-FACE project were to be implemented in full, it would create a two to three kilometre zone around the entire national park in which villagers’ rights are either eliminated or severely restricted. UWA’s rangers need to guard the trees to ensure that the trees remain in place for 99 years, in accordance with the UWA-FACE contract. Meanwhile, the benefits from the trees belong to the FACE Foundation, an organisation thousands of miles away from Mount Elgon. Whether the trees are actually storing more carbon than would be the case in the absence of the project is impossible to determine. As it is, the project is contributing to villagers’ problems and making a solution to those problems more difficult. Funnily enough, providing suggestions on climate – the biggest problem facing life on the planet – is easy: We need to reduce our greenhouse gas emissions. We need to leave fossil fuels in the ground. Part of this involves doing away with false solutions such as planting trees as carbon sinks which allow the rich North to continue polluting. There is no such simple solution to the ongoing conflicts at Mount Elgon. Villagers have seen a series of actions from the government and from international agencies. Each one is another stage of a long running dispute. Villagers view each attempt to resolve the disputes in the historical perspective of past government actions, which include gazetting the national park and eliminating all their rights to their land. This is not to say that improvements are not possible, just that they are outside the framework imposed by the UWA-FACE project. A constructive solution from the point of view of many local people might be that the FACE Foundation should leave Mount Elgon altogether. Slieker is being illogical in excluding this as a possible solution. Cernea works at the World Bank and is Research Professor of Anthropology and International Affairs at George Washington University, Washington DC. Schmidt-Soltau is a member on the Board of Directors of the International Network on Displacement and Resettlement and is a coordinator for the IUCN-CEESP global assessment of the social impact of protected areas. Michael M. Cernea and Kai Schmidt-Soltau (2003) “National Parks and Poverty Risks: Is Population Resettlement the Solution?“, paper presented at the World Parks Congress, Durban, South Africa, 8-17 September 2003. David Himmelfarb (2006) “Moving People, Moving Boundaries: The Socio-Economic Effects of Protectionist Conservation, Involuntary Resettlement and Tenure Insecurity on the Edge of Mt. Elgon National Park, Uganda“, Agroforestry in Landscape Mosaics Working Paper Series. World Agroforestry Centre, Tropical Resources Institute of Yale University, and The University of Georgia, page 12. World Bank (2001) “Operational Policy 4.12: Involuntary Resettlement“. Amanda Ingram and Mark Reed (no date) “Land use and population pressure within and adjacent to Mount Elgon National Park: Implications and potential management strategies“, Project Elgon, Leeds University. David Himmelfarb (2006) “Moving People, Moving Boundaries: The Socio-Economic Effects of Protectionist Conservation, Involuntary Resettlement and Tenure Insecurity on the Edge of Mt. Elgon National Park, Uganda“, Agroforestry in Landscape Mosaics Working Paper Series. World Agroforestry Centre, Tropical Resources Institute of Yale University, and The University of Georgia, pages 16-17. David Himmelfarb (2006) “Moving People, Moving Boundaries: The Socio-Economic Effects of Protectionist Conservation, Involuntary Resettlement and Tenure Insecurity on the Edge of Mt. Elgon National Park, Uganda“, Agroforestry in Landscape Mosaics Working Paper Series. World Agroforestry Centre, Tropical Resources Institute of Yale University, and The University of Georgia, page 20. Alan Rew, Eleanor Fisher and Balaji Pandey (2000) “Addressing Policy Constraints and Improving Outcomes in Development-Induced Displacement and Resettlement Projects“, A review prepared for ESCOR and the Research Programme on Development-Induced Displacement and Resettlement organised by the Refugee Studies Centre, University of Oxford, January 2000. Kapchorwa District Landcare team (2006) “Kapchorwa Landcare Chapter, Kapchorwa District, Uganda“. David Himmelfarb (2006) “Moving People, Moving Boundaries: The Socio-Economic Effects of Protectionist Conservation, Involuntary Resettlement and Tenure Insecurity on the Edge of Mt. Elgon National Park, Uganda“, Agroforestry in Landscape Mosaics Working Paper Series. World Agroforestry Centre, Tropical Resources Institute of Yale University, and The University of Georgia, page 21.